Rent a luxury supercar to arrive in style to one of 2016 automotive highlights - Top Marques in Monaco. Aside from spectacular vehicles, admire a range of luxury products, including yachts, jewellery and designer footwear. Monaco, the international capital of luxury, is getting ready to host this year’s Top Marques event. The guise of 'the world’s most exclusive car show' is deceptive; the event features so much more in the form of yacht displays, designer footwear, handbags and jewellery, real estate exhibitions and wine products. Manufacturers from all over the world choose this niche exhibition as the ideal place to present their most exclusive products and unveil their latest state-of-the-art technologies. Top Marques Monaco 2016 will be held at the award-winning Grimaldi Forum from 14th-17th April. The structure's magnificent glass veneer reflects an image of the Mediterranean Sea and provides a suitably lavish venue for the prestigious event. Although Top Marques Monaco 2016 will celebrate an impressive array of luxury products, its tantilizing selection of automotive displays are most eagerly anticipated. Last years exhibitors included Ferrari, Lamborghini, BMW, Mercedes, Porsche and Tesla, but the most alluring draw was the world’s most advanced prototype of a flying car. The Slovakian-designed AeroMobil is a roadster that transforms into a two-seater light sports plane. Its unveiling in 2015 sparked an international media frenzy. This year looks likely to offer even more amazing debuts, such as the Icona Vulcano, the world’s first ever supercar made entirely of titanium. This powerhouse can accelerate from 0 to 60mph in just 2.8 seconds and was the brainchild of ex-Ferrari F1 director Claudio Lombardi and Lancia Racing Team’s Mario Cavagnero. The car was built by Italian coachbuilder Cecomp to reach a top speed 220 mph and although no price has been disclosed it will likely be in the range of USD 3-4 million. Ticket holders are also excited about the unveiling of ArcaBoard, the world’s first flying hoverboard. If you enjoyed the Back to the Future movies, you will love this new green technological innovation, which runs entirely on electric energy. Created by ArcaSpace Corporation, and dubbed a '21st-century flying carpet,' ArcaBoard can fly one foot above ground level and will reportedly be on sale for around USD 20,000. More airborne fun can be enjoyed with the Martin Jetpack. Visitors will have the opportunity to experience flying the recreational contraption using a full motion simulator, which perfectly encapsulates Top Marques’ dedication to cutting-edge innovation and technology. The Martin Jetpack gives a glimpse of how travel may look in the future, with the first pack scheduled for retail later this year at a price of USD 200,000. Sales are targeted towards government, military and emergency services, who would benefit from being able to reach areas inaccessible by road and will be able to get to the top of tall buildings quickly. Other Top Marques Monaco 2016 highlights will include an exhibition of five cars from the latest 007 film, Spectre. Driven by Daniel Craig, The Aston Martin DB10 will be the exhibition's central attraction, along with the Jaguar C-X75, which was driven by Spectre’s villain, Hinx. There will be plenty of debuts of the off-screen variety too, such as the seriously fast but street-legal Donkervort D8 GTO, the fabulous Corvette Z06 supercar and the brand new Lexus range, including the RX 450h. Best of all, Top Marques is the only event in the world where customers get to test drive the supercar of their dreams on Monaco’s famous Grand Prix circuit. 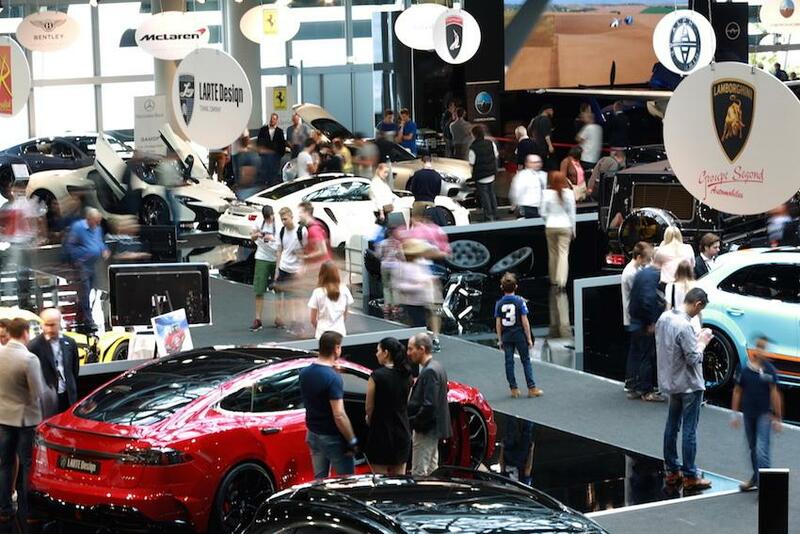 Originally established as a dedicated supercar show 13 years ago, Top Marques Monaco has gone on to become one of the biggest and best luxury goods shows, loved by shoppers and connoisseurs alike. Visitors can expect to see some of the world’s most unique machines and technological gadgets alongside classic cars and elegant brand names, so prepare to be dazzled. The Grimaldi Forum is served by an excellent rail and bus service, and international visitors can arrive by plane at Nice Cote d’Azur Airport, which is a short distance away. Ticket information can be found online. If you are interested in a luxury car rental to arrive at the event in style, please contact a member of the team.